My inbox and IM queue is full today. After a long wait, rumors, and buzz, Logic Pro 8 is here. It’s a huge overhaul, from UI to features, but the big news for many will be the price: US$499 now buys you Logic Pro Studio, which now also includes Apple’s Soundtrack Pro audio editor. New user interface: Logic’s UI has been rebuilt from the ground up with a new, single-window view, evidently largely inspired by Soundtrack. You never have to switch windows to make an edit. Digital Performer, Cubase, and SONAR have all found their own ways of doing this, and single-window editing is part of what many Pro Tools users say makes them loyal. Apple’s implementation is unique, though, so it’ll be interesting to see it in action. Set up tracks more easily: Just configuring tracks and routing was often a challenge in earlier releases of Logic, partly because of the sophisticated Environment, a modular audio and MIDI system, lurking beneath. The good news: there’s a new track setup, streamlined channel strips, and Apple Loop-like channel strip preset management. The bad news (for Logic 7 ninjas): the Environment is a casualty. Reworked audio editing and recording: Again, taking from Soundtrack but expanding upon its ideas, you get new features for multi-take editing, comping, sample-accurate waveform editing right in the main window, snap-to-transient editing, and other enhancements. Leave your dongle, because it’s gone — serial number authentication only. Bigger bundle, lower price: Logic now includes Soundtrack Pro, plus the new onstage features, and still has all of the instruments, effects, and sound library as before, all for half the price: US$499 list. The Environment Lives! And to its naysayers, I’ll just have to call up Steve Horelick, get together with Logic 8, and put together a whole bunch of new tutorials demonstrating how cool this is. The holy grail of music software right now: make it easier for people to actually play with computers. 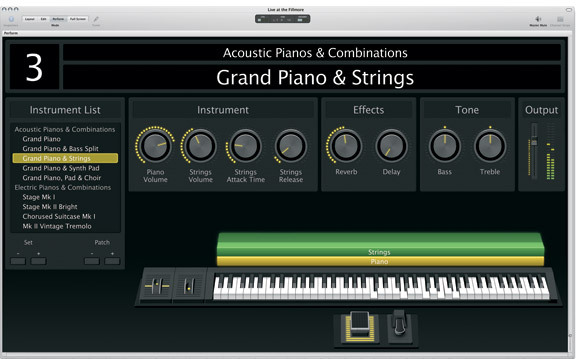 MainStage is Apple’s entry, with full-screen graphics and virtual racks of instruments and effects. Whether it will do everything people need remains to be seen. Instruments and effects look largely untouched: The old Emagic goodies are reskinned, but otherwise appear unchanged. (There’s just one new effect, called Delay Designer, from Soundtrack Pro.) What you do get, of course, is expanded surround support and all the other improvements; you just don’t get a new virtual instrument, in case anyone was wondering. The good news is, all of those oddball toys appear to still be there, and now cost half as much. No more Logic Express: Sorry, I’m completely wrong. But while I usually don’t like “entry level” versions of products because I think they too often confuse consumers, this one actually makes some sense. The sincerest form of flattery: I’ve heard claims that Logic 8 is inspired by Ableton Live, but I don’t see that. Live’s interface is very different aesthetically and functionally, and its centerpiece is the clip and the many things you can do with them. There’s nothing in Logic quite like the non-linear, clip-based Session view and its on-the-fly arrangement, and that makes sense: Live isn’t the right tool for everything, and Logic fits in as a different piece of the puzzle. Logic’s inspiration seems to come primarily from three applications: GarageBand, Soundtrack Pro, and plasq’s little-known Rax 2.0. When both GarageBand and Soundtrack Pro arrived, many wondered when Apple’s flagship DAW would start to be more, well, Apple-like. Logic Pro 7.x took some cues from GarageBand, like integrating loop support and file exchange capabilities. 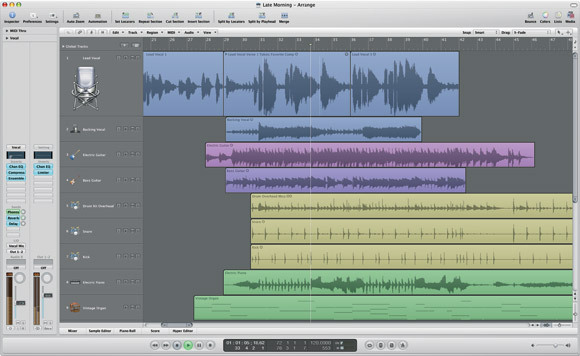 But it’s really Logic 8 that takes a stab at what GarageBand would look like if it were built for pros. Much of that comes from Soundtrack Pro’s editing panes, and that’s not only skin deep: Soundtrack’s audio editing features had surpassed Logic’s in some areas, and this version not surprisingly has a lot of emphasis on those. The surprise is that Apple has taken a lot of ideas about how to make live performance work from plasq’s Rax, which just changed hands. They even borrowed the name: “MainStage” instead of “OnStage.” (In fairness, they may also have been inspired by fluq’s OnStage, but that, too, was intentionally drawing from Rax.) Whether this was direct inspiration, or simply a filtering of important ideas about how to do live performance up through Logic’s pro user base, these changes are welcome. I look forward to trying Logic 8 first-hand; you’ll be the first to hear more. We’ll also have some Logic tutorials and tips coming in the near future, as well. Stay tuned.